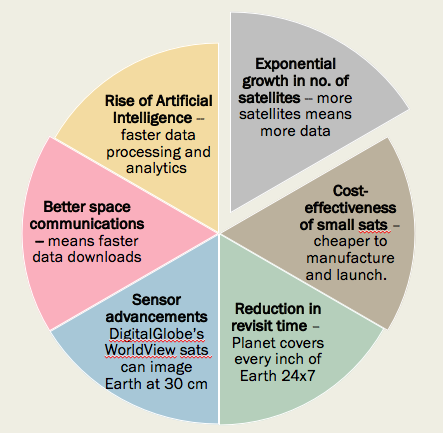 Technological advancements and path-breaking innovations have ushered in a new era of Earth observation, making satellites more relevant to businesses and the public good. This is not only changing the way we study Earth but also taking journalism to new orbits. Let’s see how. Establishing Correlations: You have a story, but you need confirmations, correlations to connect the dots, tying up loose ends or clues for where and when. As we saw with the BBC’s expose of the murders in Cameroon, satellite imagery is capable of providing this kind of intelligence. And more. “After a tip off from a Cameroonian source, we found an exact match for that ridge line on Google Earth,” BBC News Africa revealed on Twitter. “Once we had the general location, we looked at other details in the film — tracks, buildings, trees — and matched them precisely to features visible on satellite imagery,” it added. That is when the team approached DigitalGlobe, a Maxar Group company. “We poured through images of six years and looking for clues and were able to able to pinpoint the month and year by matching them with the presence of objects like buildings, trees or roads,” explains Steve Wood, Senior Analyst, Maxar News Bureau. 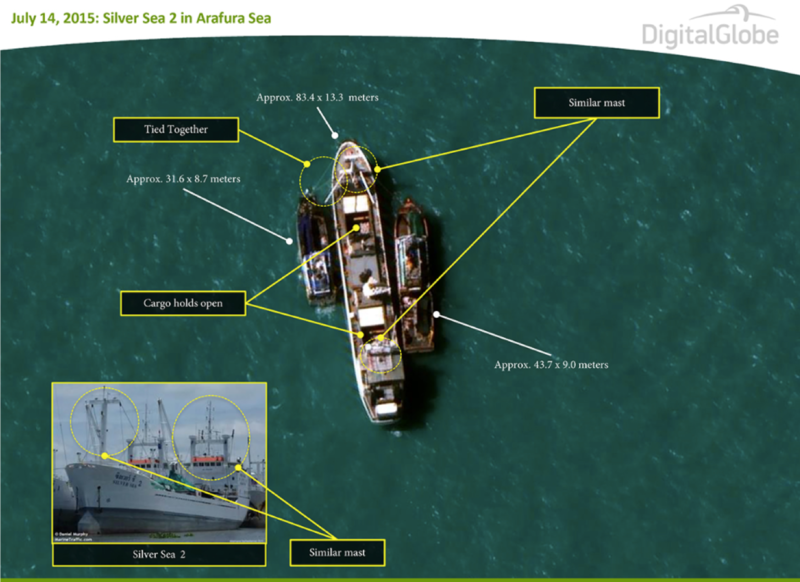 Smokin’ Gun: DigitalGlobe provided this image to Associated Press that showed two trawlers loading slave-caught seafood onto a commercial cargo ship. Similarly, the Pulitzer prize winning story of Associated Press which exposed a human trafficking ring in 2015 was tracked with DigitalGlobe cameras. After months of going around in circles chasing a trail of human traffickers in the waters of Indonesia and Papua New Guinea, AP requested DigitalGlobe to train its satellites on a designated area in the deep seas. The now-famous “smokin’ gun” image caught two trawlers loading slave-caught seafood onto a commercial cargo ship. More than 2,000 enslaved men were freed; Indonesian government launched a massive investigation; US laws regarding import of fish were changed. Breaking News: This is as simple as having an exclusive incriminating photo in your hand. Satellite imagery by Planet shocked the world when it exposed secret Iranian facilities developing nuclear rockets. The imagery not only captured ongoing construction in the facility in the desert but also captured strange marks on the sand of what looked very similar to rocket landings or takeoffs. Climate Change: Monitoring climate activities is one of the very prominent uses of satellite imagery and is used extensively to show change in a particular piece of land compared to an earlier time period. From the Ground Up: Landsat and Sentinel images show 30 years of change in Amazon rainforests. For instance, ESA used Landsat and Sentinel data to show 30 years of change in Amazon rainforests. In this set of images, red shows vegetation. Increasing patches of brown on the right image shows alarming deforestation. This is of great concern since the Brazilian rainforests play an important role in global climate. And unlike other forests, rainforests don’t grow back. Change Detection: Reuters used imagery from Planet to track expansion and condition of Rohingya refugee camps in Bangladesh. 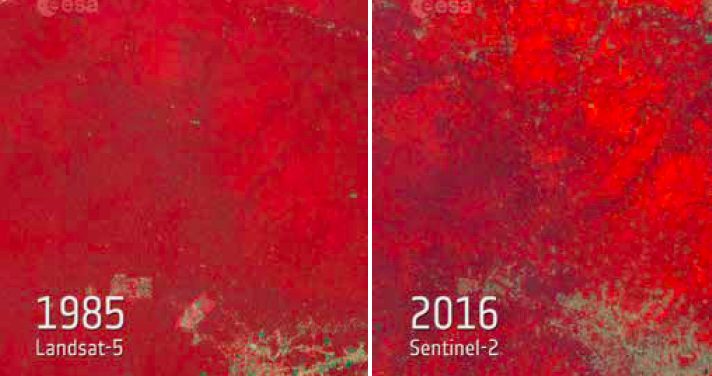 Settlement Growth: Planet imagery used by Reuters to track Kutupalong and Balukhali extension sites and camps for Rohingya refugees in Bangladesh. The story, called “Life in the Camps,” which won the Data Journalism Award 2018 for data visualization, showed how the camps have grown at an alarming speed in a few months. There are thousands of people packed in the shelters that lack basic hygiene, or even food or water. Similarly, in Turkey or the conflict-prone South Sudan, satellite imagery has been used to track and report on miserable conditions in refugee camps. War Zone Reporting: Satellite imagery has become an effective tool for reporting in conflict zones — be it for pinpointing collateral damages or human rights violations. In the protracted conflict in Syria or Iraq, satellite imagery identified ISIS strongholds, the extent of devastation in Aleppo, and the ravaged archaeological and heritage sites. Destroyed: Liberation of Ramadi from ISIS with pre and post images show wide-scale devastation. For instance, this set of images of pre- and post-liberation Ramadi from ISIS, shows wide-scale devastation. According to analysis of satellite imagery by the United Nations, nearly 2,000 buildings, streets or bridges, were destroyed between July 2014 and end of January 2016. Tracking Terror or Authoritarian Regimes: In terrorist-held areas like where ISIS, Boko Haram or the Taliban operate, which are inaccessible to media or civilian authorities, satellite imagery can give the scale of atrocities or damages. Similarly, satellites can be the only source of information on what is happening inside North Korea, a country cut off from most of the world. EO imagery has for years been used to track and report on not only DPRK’s missile development activities, but also for tracking general life in the country — state of electrification, vegetation, housing, etc. 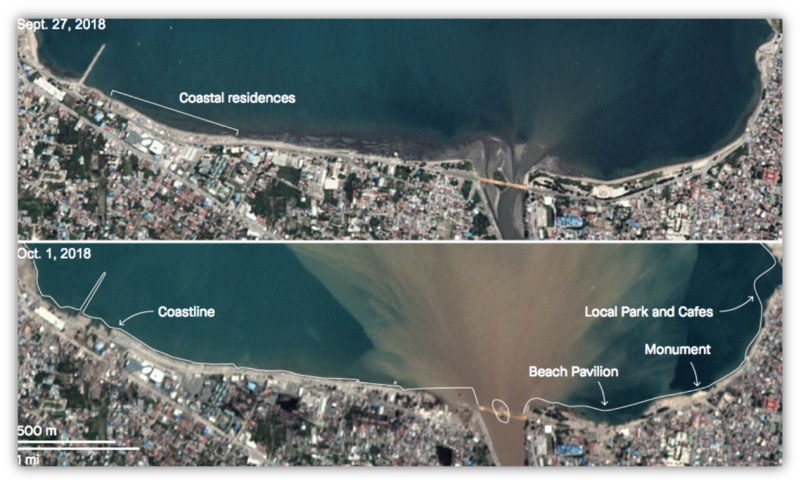 Access to the Inaccessible: In disaster zones where immediate human visit is impossible, satellite imagery can give insight into the damages or warn for worse to come. Exploded View: DigitalGlobe took this picture of Fukushima nuclear plant three minutes after the first explosion on Mar 11, 2011. 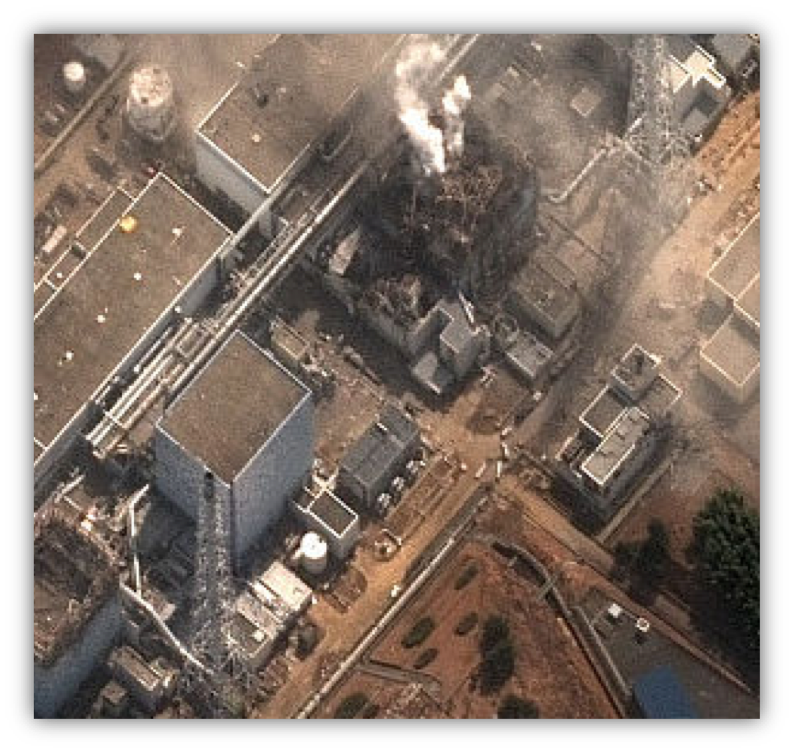 For instance, DigitalGlobe took the picture of the explosion at the Fukushima nuclear plant barely three minutes after the first reactor blew up on March 11, 2011. This image was instrumental in telling the world about the actual situation on the ground at Fukushima when the area was inaccessible. After the Tsunami: Satellite images show how residential areas along the coastline in Indonesia completely disappeared following the devastating earthquake and tsunami in September 2018. Satellite photos can reveal the devastation and damages following dangerous events like volcanoes, earthquakes or floods. For instance, a set of before and after images shows how residential areas along the coastline in Indonesia completely disappeared following the devastating tsunami in the last week of September 2018. Forewarning for Weather Events: National space agencies like NASA, ESA, ISRO, etc. regularly give updates on major weather events and impending natural disasters. Media houses can track such warnings to amplify to the local population for evacuation and exigencies, or to disaster management authorities to take proper action. Adding Visual Elements: One could simply use them for adding a stunning visual effect in a story on some major event. 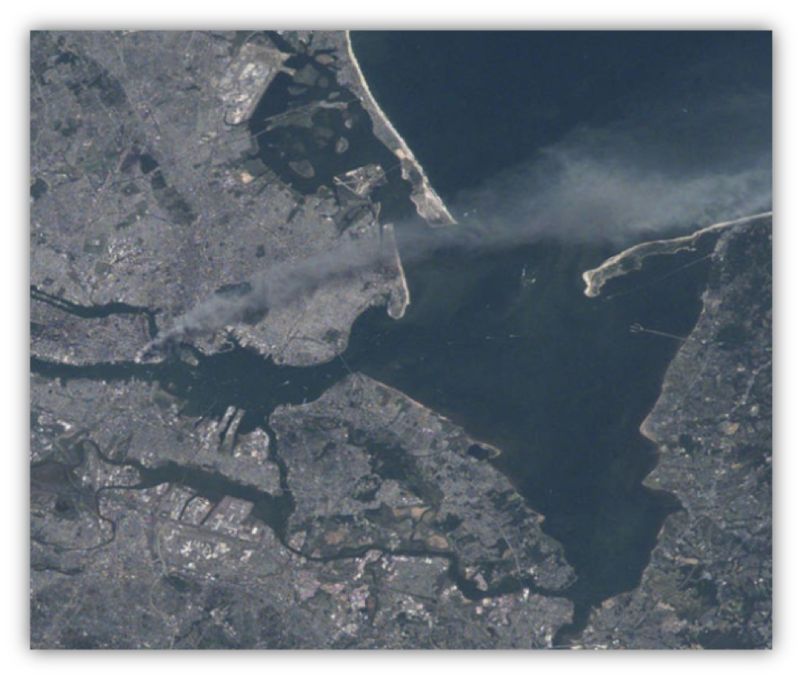 For instance, this 9/11 image of the World Trade Centre captured from International Space Station by NASA Astronaut Frank Culbertson — the only American off the planet at that time — shows a plume of smoke coming from the site. Satellites have been used to image the crowd at US President Barack Obama’s inauguration ceremony in 2009, participants at the Women’s March in 2017 following the inauguration of US President Donald Trump, and even stadiums and crowds at major sports events such as the Olympics or FIFA World Cup. Despite the humongous costs associated with putting each satellite in place and operating them, there are several sources of data which come absolutely free. NASA’s Landsat imagery is freely available on the USGS website, while ESA’s Copernicus dataset is available via the Sentinel hub. The Indian space agency ISRO’s Bhuvan portal is a great resource for free imagery, but a lot of it could be dated. Google Earth is the most popular for seamless availability, but remember it is not always available at great resolution and could have errors due to stitching problems. Commercial satellite providers like DigitalGlobe and Airbus give some data for free, mostly during natural disasters. Planet also has a news section where one can get imagery as well as tools. Other than the standard data, there are some specialized services available to journalists. Maxar News Bureau: This is a partnership of the Maxar group with trusted media organizations. The bureau provides services in two ways — push and pull. In the push form, Maxar sends out standard set of imageries of select events/happenings to registered media houses for publication. The pull part is “a unique concierge kind of a service wherein Maxar digs up exclusive datasets for a news organization or provides its own imagery analysts to work dedicatedly with journalists to find the hidden meaning in unraveling a story via use of satellite images,” said Turner Brinton, director of public relations at Maxar. Tasking of Satellites: This again is a unique service from Maxar where a media organization needs to keep watch over a particular piece of land at a certain given time. One just needs to contact the Maxar News Bureau to task DigitalGlobe satellites on the area of interest. Of course, this comes at a price. One can also get help from tools such as Tomnod, GeoHive, OpenStreetMap, Esri’s Living Atlas of the Planet. Tomnod is a volunteer-driven initiative which uses DigitalGlobe’s satellite imagery and builds on crowdsourcing data, and is open and free for use. In March 2014, Tomnod offered satellite images to the public for identification following the disappearance of a Malaysian Airlines plane. The site was down for two days due to high traffic (100,000 visits per minute). OpenStreetMap has a huge dataset which is open and has over four million registered users today. The Humanitarian OpenStreetMap Team in particular focuses on crisis mapping around the globe, making extensive use of satellite imagery donated by a variety of organizations. Esri’s Living Atlas of the World gives access to maps and imagery layers from Esri, Esri’s partners, and thousands of ArcGIS users from around the world. Some of this is open and some accessible only for ArcGIS licensees. Visualization Tools: Journalists also have the option to use many easily available tools to present their imagery-heavy stories in an attractive way. Other than Esri Story Maps, which are hugely popular and easy to use, there are many free and open source tools such as TimeLine JS, Odyssey.js, Thinglink, Mattermap, Widgetic and others to present stories in an engaging format. 3D and Augmented Reality: Increasingly used in weather stories to show effects of, say, a hurricane striking a city, a lot of these are open source, free and easy to use. Even though satellites are opening up new frontiers in journalism by providing reporters with a ‘Bird’s Eye’ view, the availability of incontrovertible data, and precise information, there are some guidelines one must keep in mind. Don’t use imagery just for the heck of it: Satellite imagery shouldn’t be used simply because it’s cool if it doesn’t add any value to the story. For purely decorative purposes, simple photos are always better. Even when something has happened somewhere, if your imagery is not adding any intelligence to the story it is better to use a map to give the spatial context. Don’t dig into too-technical datasets: National space agencies like NASA or ESA have satellites which use radar or other scientific instruments to measure ice, wind, ocean, etc. One needs experts to analyze these specialized datasets. Therefore, such imagery should be accessed only in cases where the media team has data analysts who can read it. The best option is to fall back on NASA/ESA-generated stories on these topics (they actually do a lot of these) or else speak to an expert. Know you are lucky to have a satellite flying by: But also be ready to be disappointed. Sometimes you may not get anything of a particular area at a particular time — due to time, resolution of the satellite, cloud cover, etc. If you have the resources, you could ask DigitalGlobe to task a satellite. Satellites cannot monitor an area many times through the day: Despite the reduction in revisit times, the best-case example is Planet, which can monitor all of Earth only once a day. They can’t get much insight at night: Clouds and smoke can also impede satellites. There are radar satellites that can look through clouds or image even at night. But again, unless someone is there to analyze those images, it won’t be possible for a layman to read them. Resolution matters: Know what you want; know what details you want. If you are looking at a flood-hit city or a quake-hit terrain, civil government satellites like Landsat and Sentinel are excellent free sources of data. “To understand human-scale activity, like what’s going on at a construction site, high-resolution imagery is necessary,” Brinton noted. Even high-res has limitations: Remember, even 30 cm resolution of WorldView 3 and 4 from DigitalGlobe can give you only so much. For instance, satellite images can detect people, but can’t identify them; they can detect vehicles on the road but can’t identify the model. Many journalists still operate with the mindset that imagery is for just visualization — which is the last stage while presenting a story — when imagery could be your primary set of data many a time. This article first appeared in Geospatial World and is reprinted here with permission. Get more at GIJN’s Resources for Finding and Using Satellite Images. Anusuya Datta is executive editor at Geospatial Media & Communications. She is a writer by choice, an editor by profession, a technology commentator by compulsion. She’s passionate about news and numbers, but it is global geopolitics which excites her most. Datta presented The New Age of Satellite Imagery at #IJAsia18.